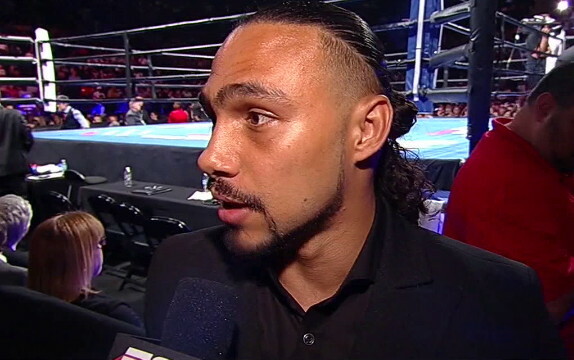 Thurman Turns the Screws on Amir Khan / "Show Me a Contract"
If his fight with friend and rival Shawn Porter doesn’t come off as soon as he or the fans would like, then Florida’s Keith Thurman has turned the screws on Britain’s Amir Khan once more, telling assembled media repeatedly over the weekend that he would like to test the Bolton man’s chin in the ring. Thurman had been upset by comments Khan made referencing their respective wins over New Yorker Luis Collazo, in which Khan suggested Thurman doesn’t have the one punch power his ring moniker would have you believe. Khan floored Collazo three times 14 months ago, cruising to a points win, whereas “One Time” was hurt from a solid body shot in the 5th before Collazo’s corner eventually stopped the fight after 7. Both men also hold wins over Julio Diaz, who is essentially a blown up lightweight. Thurman had Diaz down before busting his ribs with a shot and making him retire after 3 rounds. Conversely Khan was caught flush and down from a left hook in the 4th before getting significantly hurt again later in the fight and winning the decision against the Mexican veteran. “You can talk about how he did that to Collazo and Collazo hit me with a body shot but Diaz hit him on the chin and dropped him. Diaz didn’t touch me with anything and I made him retire. It will be interesting to see how Khan responds. Many fans are longing for him to face a genuine 147 lb fighter with power, and Thurman fits the bill perfectly. With Khan stubbornly refusing to fight IBF champion Kell Brook as he isn’t “a big enough name,” it’ll be interesting to see if he makes a similar excuse regarding Thurman, who enjoys a far wider base of support than the Sheffield man does in America AND enjoys a large fan base in the UK. Both men are “advised” by Al Haymon. As Thurman said, show him a contract. Over to you, Amir.